Bits & Scraps Of My Life: Look at all of this cuteness being given away!!! Look at all of this cuteness being given away!!! These are just too dog gone stinkin cute!!!!!! There is a darling giveaway going on right now over at http://karismaheartsavannah.blogspot.com/ . Seriously....check it out!! Are those tags not the cutest?????? 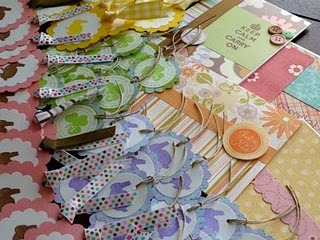 Just in time for spring and easter projects, gifts, flowers, baskets.....cards, scrap pages.......I could go on and on!!!! Head on over for your chance to win!!! Thanks so much for blogging about my Giveaway! You ROCK!